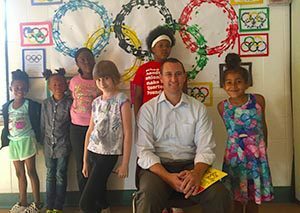 Troy CSD’s Carroll Hill Elementary School welcomed new principal Roy Stiles to the building this summer. Mr. Stiles comes to the building from Troy High School where he most recently served as an assistant principal and said he is ready to help guide CHS to greater success. Prior to his five years experience as a Troy High School administrator, Mr. Stiles was a high school math teacher for nine years, three of which were also spent in Troy. Now he hopes to use his knowledge of secondary grade level skills to help shape the instruction at the elementary foundation. One of Mr. Stiles’ goals as principal is to help Carroll Hill School become a school in good standing. The State named CHA a “Priority School” in 2016. Some of the ways he intends to accomplish this goal include creating a school-wide programs and philosphies so that every student and every teacher is on the same page. Examples of this include monthly character education themes and responsive classroom techniques as well as grade-level collaboration. In addition, there will be an increased emphasis on data analysis both for disciplinary and academic improvements. The data helps teachers and administrators see where they can improve to help students as well as what supports work best. Stiles currently lives in Niskayuna with his wife and four children. They have twin sons going into 7th grade, a daughter who will be in 4th grade and their youngest daughter who is 8 months old. As you can imagine, most of his free time is spent with his children, but says he enjoys golfing when he can.